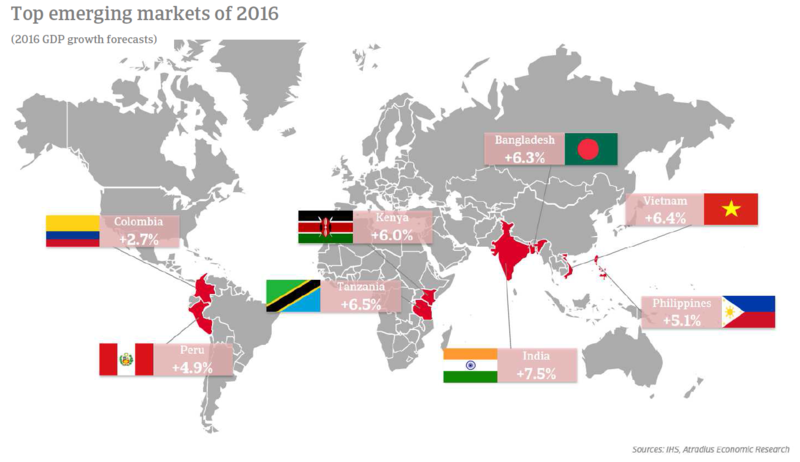 Economic conditions across emerging markets deteriorated sharply in 2015. The headwinds facing these markets are likely to continue into 2016. There are, however, some clear bright spots that are bucking the trend and showing strong performance. These are the markets with great opportunities for businesses. Why are these markets doing so well? Supportive policies – In general these are all markets that have stable political conditions combined with decent macroeconomic policies. For example Peru has developed strong institutions and Colombia has recently become much safer making government policies more effective. Commodity importers – Most of these markets benefit from the lower commodity prices, such as oil and metals, as they heavily rely on import. India, for instance, imports 75% of its oil and saved an estimated USD 2.5 billion in 2015 on fuel subsidies. Growing middle class – These markets show strong internal dynamics with rising investment and a growing middle class. The total population in Kenya, for example, has grown by 50% over the past fifteen years, boosting the domestic economy. In India, with further growth in industrial activity and an improving performance outlook for key end-user segments, import demand for plastics and chemical goods is expected to remain strong. In Peru, construction is a growth sector due to continued investment by the Peruvian Government. In Kenya and Tanzania dedicated construction businesses from abroad could benefit from infrastructure growth, including the building of new ports. 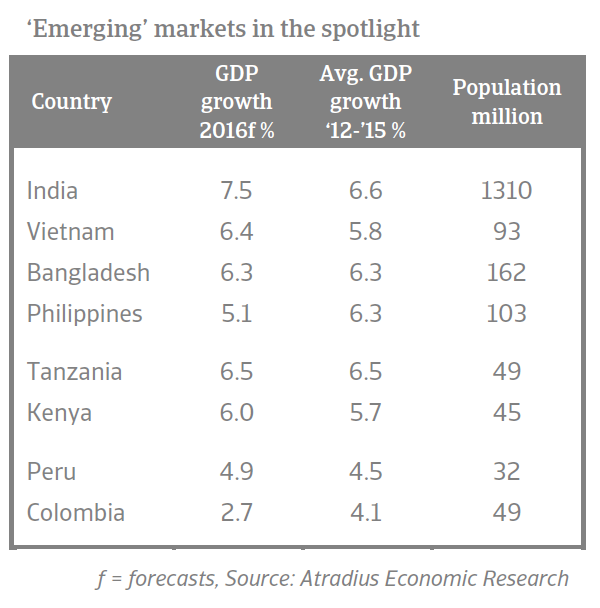 The Asian markets of Bangladesh, India and Vietnam all provide business opportunities for exporters in the consumer durables and electronics segments, due to increasing disposable incomes, urbanisation and rising living standards. India’s retail market is expected to nearly double to USD 1 trillion by 2020 from USD 600 billion in 2015. In Vietnam there is a perceived preference for foreign brands, deemed to be of better quality and hygiene standards. 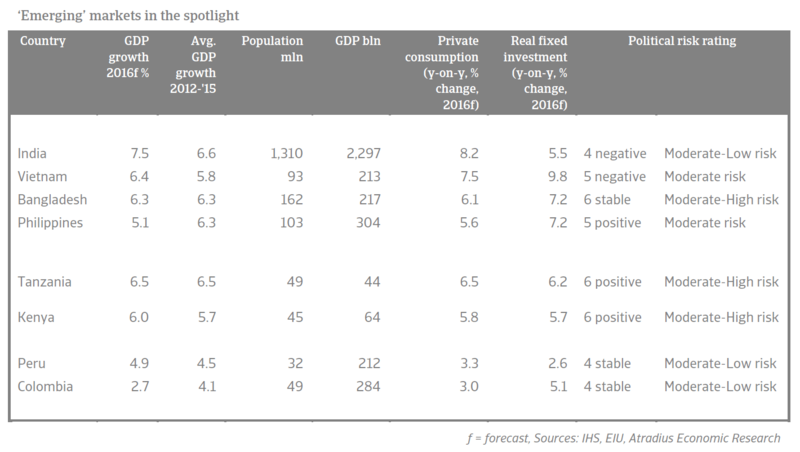 Colombia is expected to be the most attractive retail market in Latin America for foreign investors over the next five years, with private consumption forecast to remain a major driver of economic growth and as formalisation in the industry will increase (about 50% of total food retail still account for the informal retail sector). At the same time ICT is one of the most promising growth sectors in Peru, as the penetration rate in this market is still low: only 30% of population have access to internet service. In Vietnam, the government supports the increase of household PC penetration in rural areas. 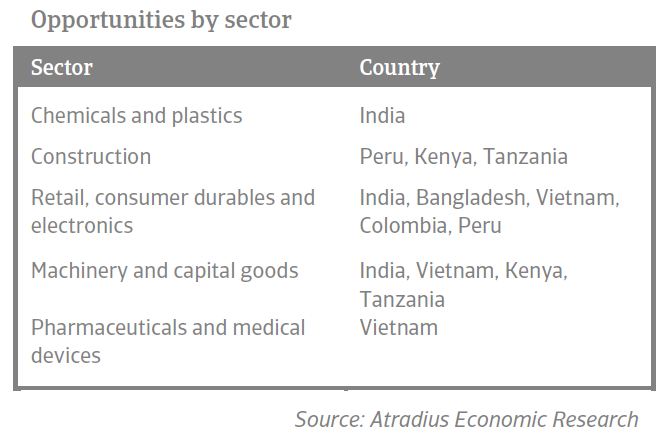 A growing economy and increased infrastructure investments provide export opportunities for machinery and capital goods businesses in India, Vietnam, Kenya and Tanzania. However, in the two latter markets price competition from Asian machinery businesses is high. Vietnam is expected to become a growth market for pharmaceuticals, as the government aims to improve the health system. Vietnam has a large, yet unmet need for healthcare and medical devices, and continued major investment is required.